Here’s a picture of the oar at two points in time. On the left-hand side of the picture, the frame of reference is the boat. This is the usual perspective of the rower moving down the slide and pulling the oar. 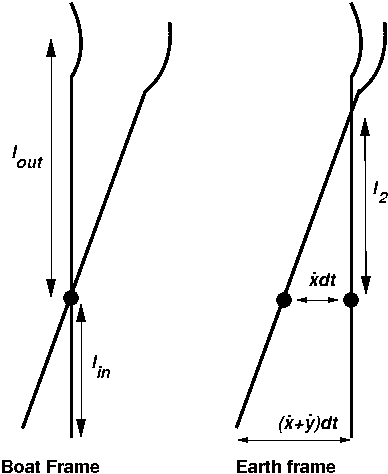 On the right-hand side, the same oar, at the same points in time, in the reference frame of the public standing on the bank. What’s not clear from the perceptive of the rower but should be noticed by an accurate observer on the bank, is that the blade slips through the water. The oar is a lever, but the effective outboard length of the lever is given by rather than by . 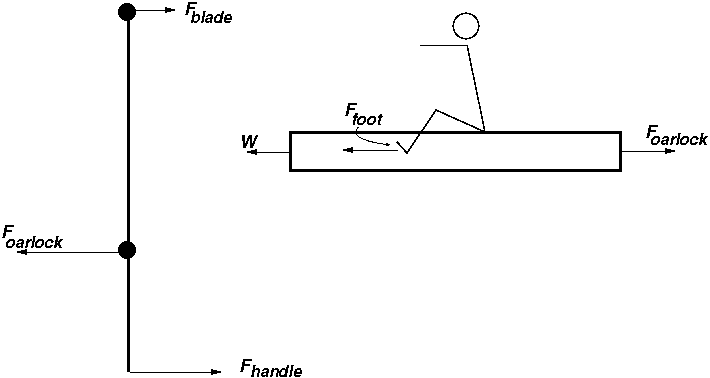 Voilà, the net force on the system equals the blade force minus the drag force. This is logical, as the blade and the hull area are the only points of contact between the boat and the rest of the world. The system net propulsive force is given by . Still nothing new here, dear readers. In the next post, I will finally address the energy balance question. This will be an interesting one, as there are differences between the findings of the two giants (on whose shoulders I stand) about the amount of energy dissipated in the body of the rower. I have removed the references to a virtual outboard from this text. The use of this virtual outboard is not necessary and leads to erroneous results. I have updated my model accordingly. This entry was posted in rowing physics, Uncategorized on July 19, 2010 by sanderroosendaal.